Photos Illustrate Pirsig's "Zen Art Motorcycle Maintenance"
Via California Trail & the Oregon Trail. Following the Route of the California Gold Rush ‘49s (In Reverse Direction): This album shows Panoramas of my return trip. Introduction: My ZMM Research, following the "ZMM Route", of coursed ended in San Francisco. On my way home to Aiken, South Carolina, I first visited Stutters Fort, Sacramento. It is still there, but now a Historical Monument. This was a good start point for following the California Trail (backwards) into Nevada and Idaho. In Idaho, now joined with the Oregon Trail, I followed both trails (backwards) from Southern Idaho to St. Louis, MO. Along the route were fantastic wide open natural landscapes, many informative local history signs, commemorative monuments (re California/Oregon Trail), and a wonderful fossil museum at the Fossil Butte National Monument. After I left San Francisco, I traveled East on I-580 and crossed Altamont Pass by Livermore and through Stockton. In Sacramento, I was quite excited to visit the old Stutters Fort (mentioned above). Going N. East, I soon switched into the old paved road, parallel and just south of I-80. This is the old route of the California Trail over to Donner Pass. I followed the Historic California Trail (backwards) into Nevada. In fact, following the entire Historic Trail of California Gold Rush ‘49ers was a very rewarding experience! Very thrilling both for the history experienced (first hand) and the incredible natural beauty and open spaces. Altogether, my trip back was just as thrilling as the ZMM route itself, which is saying something!! Moreover, as mentioned elsewhere in this Photo Gallery, I have one of Robert Pirsig’s old National Geographic full size wall maps on which a pre-1968 versions of the ZMM Route had been "inked-in". Significant to this discussion, the “Route of the ‘49ers’ is likewise marked on this map! Thus, for Pirsig Pilgrims, there are multiple reasons why I highly recommend ‘49ers route. Here now are my panorama photographs taken on my return trip. Henry Gurr, June 07. Special Note: These Panoramas were arranged and edited by Stacey Mosier. Ms. Mosier, a Graphic Arts Major at the University of South Carolina at Aiken, recently transferred to the University of South Carolina at Columbia, the "Main Campus". Help & Details Re Photos and Panoramas. Created on 06/08/2007, last changed on 03/11/2013. This album contains 11 items. This album has been viewed 10141 times since 06/08/2007. Views of John and Sylvia Sutherland's Former Home at "Twenty-Six-Forty-Nine Colfax Avenue, Minneapolis. " On my trip in the summer of 2006, I showed the former home of John and Sylvia Sutherland (seen in these photos) to Anthony McWatt and MOQ film crew. In ZMM (page 143), the Narrator quotes John Sutherland's disparaging comment about their home and life back in Minneapolis. So here are 18 photos of what is here at the address quoted. Despite John's statement, this looks to us like a wonderful home along a quiet shady street, in a perfectly fine neighborhood! 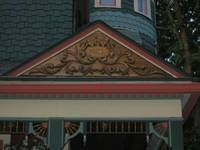 We found it empty and for rent, so we fully used the chance to experience and absorb this fantastic, multicolored Victorian masterpiece! Although this style of architecture is not normally my “type”, it was still fun to be here and take photos in the bright sun. In these views you will see Anthony McWatt, Rebecca Temmer, and Gavin Gee Cough. The MOQ video production team's photographer, David Buchanan, by happenstance is missing from my photos taken at this home. From my two trips to Minneapolis, I have many other photos and will post these in this album ASAP. Notice: If you are the person now living in this home please contact me. Anyone having (or needing) more information, please contact me. I want to hear from you. Created on 01/11/2007, last changed on 10/23/2012. This album contains 18 items. This album has been viewed 9713 times since 01/11/2007. Album 360 Degree Panoramas for Book "Zen & the Art of Motorcycle Maintenance". ZMM Pans Disc =Each of the Very Wide Photos in this "Album of Panoramas", has been made by "stitching" together (typically) eight different photos. As you are looking at these panoramas, you will be "scrolling", (left to right) through each of the 8 original pictures, in 360 degrees of rotation. The full width of these panoramas is about seven feet!! Suggestion for Beginners: Place your "mouse pointer" on the photos in this album (any photo in this Gallery) and if it "shows a hand", then a "mouse click" will give you will (most of the time) get a much larger view. Typically you will have to twice in succession "click-the-photo", to get the largest and best view. At this magnification, the panorama photos you are viewing are about 7 feet wide, so the view is quite dramatic!! Second Suggestion for Beginners: When you have the largest view of a panorama, you must use the "slide bars" at right side (or bottom) of the photo to view the whole picture. First use the right hand slider to adjust the picture up-down to see both land and sky. (You may have to "mouse drag" the top if the window way to the top, and drag the bottom as far as possible down. Ditto for the right and left sides of your screen window.) Then use the bottom "slide bar" to scan the whole photo, left to right. The caption of each panorama will (usually) indicate the direction of the ZMM Route and the direction of Geographic North. Third Suggestion for Beginners: Be sure to note the "Homepage” at the lower right of this (and every) Gallery page. A mouse "click on it", will take you to Menu Items (near top) that will take you to detailed information about all my Gallery Photos and how to view them. CAUTION: The Full size of these panoramas can not be viewed in slide show. Please take the time to enjoy these truly unique viewing experiences! Panorama Credit: Many thanks to John Westbrook Jr. and his trusty G4 Macintosh + AdobePhotoShop, for such care and precision in preparing these art-full panoramas! Last changed on 08/01/2012. This album contains 63 items. This album has been viewed 70864 times since 04/11/2003. ZMMquality Web Site: Our Software & How We Got Started. 4 April 2002. The photos here show some our working environment here at University of South Carolina Aiken, and a few "screen captures" of our software in use. The screen captures show the pages we work with and some of the "quirks" encountered & what to do about them. Active planning for what was to become ZMMquality WebSite, began around April 2002, when I walked over to the USCA University Library to visit Paul Lewis. I wanted his advice on what GPS Handheld Receiver I should purchase for my forth coming ZMM Research Trip. Paul is a University of South Carolina Aiken Research Librarian. Among his multitude of skills and interests, he is a first rate technology/computer expert! And among his various library responsibilities, he is in charge of the USCA Library's Global Position Information System (GIS) Computer Database. So I thought he ought to know what GPS would work best with a GIS. You will read "the rest of the story" in the captions of this album. Links to the software we use are also given. This ZMMquality Site is dedicated to Paul Lewis, since in essence, he is it's co-creator! And … with many, many hours of prime trouble-shooting and expert computer code manipulations, Paul Lewis has definitely shown he is ZMMquality's mentor and friend! Last changed on 08/31/2011. This album contains 15 items. This album has been viewed 9071 times since 11/20/2003. Science Building U South Carolina Aiken: Energy Saving, Solar Energy & Greenhouse. As These Photographs show, our New Science Building was designed to be pleasant, functional AND energy efficient. The architects were instructed to be sensitive to cost effective opportunities for natural lighting, natural ventilation, solar heat (and cooling) so as to reduce long-term operating costs and consumption of energy. Such a design could thus be a constant, living educational experience for our students as to how best to design functional/economical buildings that have low operating costs. The architects also were instructed to be sensitive to cost effective opportunities for learning and display devices during the building design process. The Sci Building Committee stated: "esthetics monies" should be used to create a building that is attention getting as well as an "active learning device. The grounds, entrance way, halls, even the building, pipes, beams, machinery and construction materials should be educational experiences that invite involvement in science and stimulate more and higher quality science learning for students and the public. 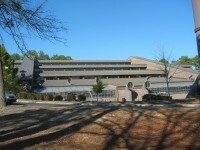 The USC Aiken new science building was completed 5 September 1989. Included in This Album is a photographic tour of the Biology Department Solar Heated Green House. Don't miss this fantastic collection of exotic and colorful plants!! Last changed on 01/10/2007. This album contains 106 items. This album has been viewed 6287 times since 01/23/2006.